The ADCA series of Amplified low pressure sensors are based upon a proprietary technology to reduce all output offset or common mode errors. This model provides a ratiometric 4-volt output with superior output offset characteristics. Output offset errors due to change in temperature, stability to warm-up, stability to long time period, and position sensitivity are all significantly reduced when compared to conventional compensation methods. 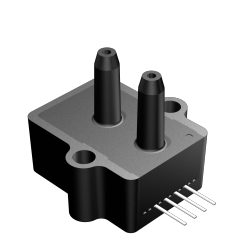 In addition the sensor utilizes a silicon, micromachined, stress concentration en­hanced structure to provide a very linear output to measured pressure. These calibrated and temperature compensated sensors give an accurate and stable output over a wide temperature range. This series is intended for use with non-corrosive, non-ionic working fluids such as air, dry gases and the like. The output of the device is ratiometric to the supply voltage over a supply voltage range of 4.5 to 5.5 volts. Note 1: Part number is available in Standard Compensation Temperature Range only. Note 2: Shift is relative to 25°C between standard, industrial, or military compensated temperature range endpoints. Note 5: The span is the algebraic difference between full scale output voltage and the offset voltage. Note 6: Parameter is characterized and not 100% tested.